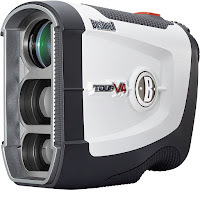 The Bushnell Tour V4 Rangefinder has been redesigned with a smaller and ergonomic build that’s easier to handle and utilizes a faster focus system for quick and accurate measurements to help improve your golf game. The Bushnell Tour V4 Rangefinder provides yardage measurements from 5 to 1,000 yards and 400+ yards to a flag, within 1 yard accuracy. The Bushnell Tour V4 Laser Rangefinder features PinSeeker with JOLT technology that provides short vibrating pulses to confirm that the laser has locked onto the flag and displays the yardage. The Bushnell Tour V4 Rangefinder utilizes a fast focus system, LCD display, 5x magnification and multi-coated optics for clear bright images. 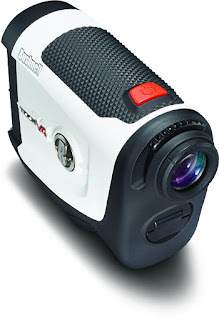 The Bushnell Tour V4 Rangefinder utilizes a Class 1 Laser with <0.5mW average power output. It is powered by a 3-volt lithium CR2 battery (included). The Bushnell Tour V4 Rangefinder is Tournament Legal and Pro Certified and comes with a 2-year limited warranty.